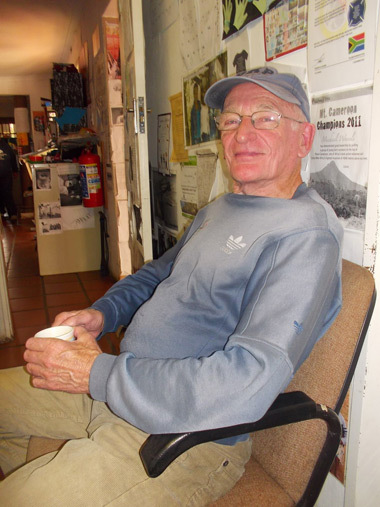 On 22nd May 2013, Nthabiseng chatted to Brian Kilner a retired former prosthetic leg maker about the pros and cons of false legs. 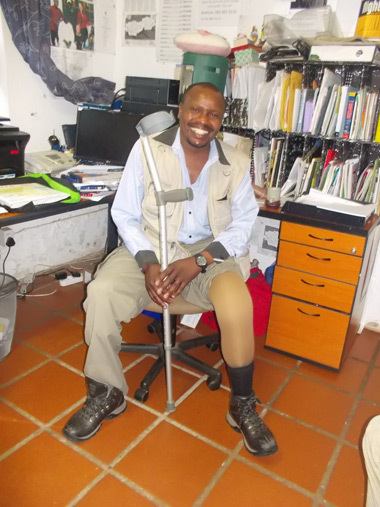 She also met Peter the Kenyan owner of the Giraffe Centre in Auckland Park who also proudly showed her his prosthetic leg. 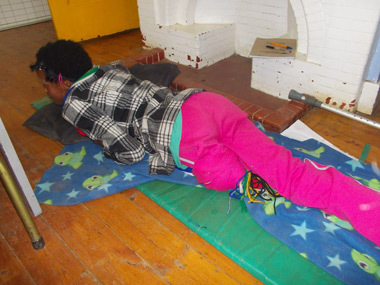 Nthabiseng was reminded to lie prone with a cushion under her chest, for lessons at school, to try to put pressure on her leg stump and to realign it so that it could one day support a false leg. 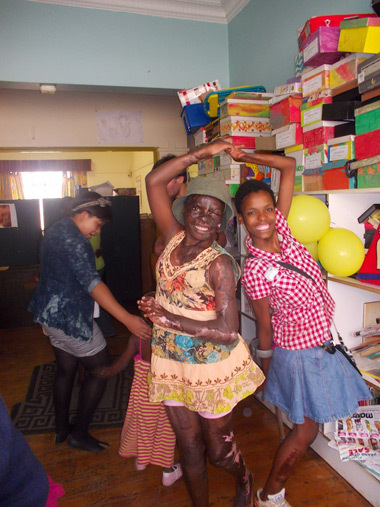 Nthabiseng went to see Evanthia Pavli, occupational therapist, at Linksfield Clinic in July 2013. Nthabiseng was told to continue with her exercise routine which would become more determined after her abdominal scar was released. She felt a lot of pain on the pulled skin. Evanthia spent more time stretching the hand, putting pressure on the fingers. 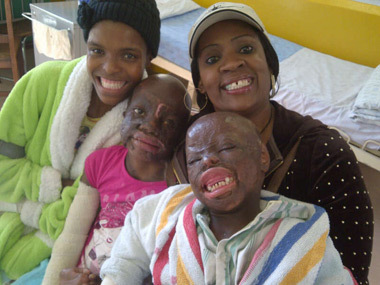 Nthabiseng arrived after a ChiFi-social worker battle in excess of 740 days. 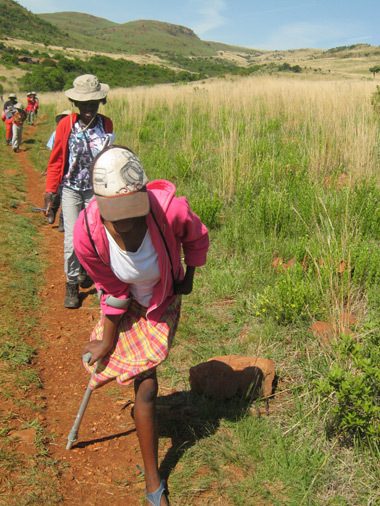 She spent time with Loide, Perlucia and other children in the Suikerbosrand before going to hospital for a prolonged period of time. 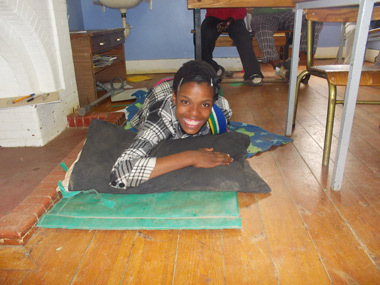 She even had a race with blind pupil Mabontle� the odds seemed even. Nthabiseng arrived here in Auckland Park at last. There was a stage where we were phoning the social workers every single day. She has not been placed correctly by the Court, which should have placed her with our founder personally. 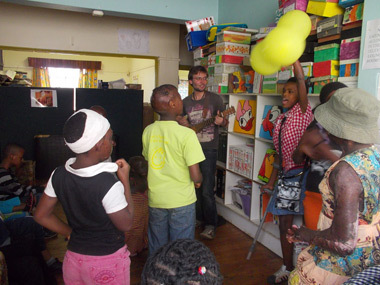 They gave no grant for the child - only to the uncle a little older than she was and with whom she was no longer living�! 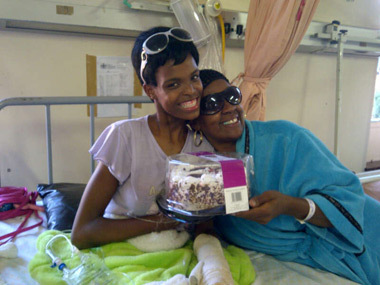 Nthabiseng has been further damaged physically and emotionally by the delay in getting her here. 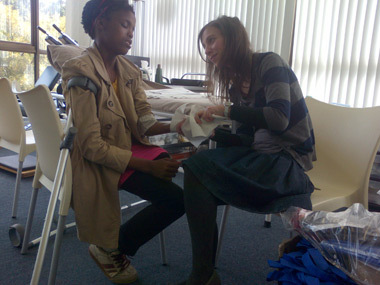 The poor child was dressing her own leaking leg wound with an old torn sock and a shabby bandage. She seemed very stoic and determined by nature. We are shocked that no social worker ever bothered to really identify the extent of her injuries and her current state of health. There was a painful area of raised skin on her hip called a hypertrophic scar. This would have to be cut away as soon as possible. That will be repaired with z-plasty (cutting z shapes in her skin and folding the points of skin together to fill the gaps) or by a skin graft. She will also have to have much of her lower left leg amputated. 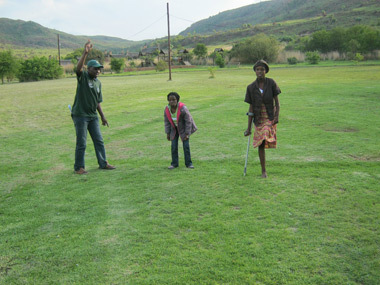 Then the doctors will have to operate so that her left leg stump points in the correct direction. 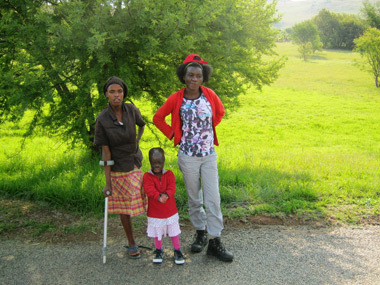 Only after all that surgery and all the healing, will we be able to battle to fund and source a good prosthetic leg. 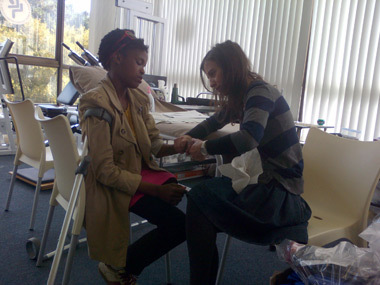 Nthabiseng's left hand also needs surgery. And an area on her abdomen. Too much time has been wasted for this child and she has been denied basic rights. The photos were taken on the first couple of days when we got her to settle in, with a hiking and environmental trip to Suikerbosrand, near Johannesburg. Then she was admitted to hospital. Two senior medical professors (reconstructive and orthopaedic) assessed her and were as upset as we were, that action was not taken earlier. 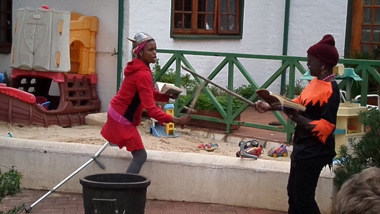 What is concerning is how Nthabiseng always entrusted adults with her care and never opened her mouth to question them, to get things explained to her in language that she understood, and how she believed that they were all acting in her best interests - which clearly some of them were not. She is a sweet girl and we will try to do what we can. This will take more than a year. 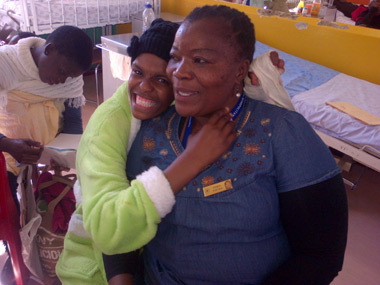 Nthabiseng made good friends with nurse Maria Sefoka when she was a patient in May/June 2013 in Chris Hani Baragwanath Hospital. She was given a short wig and sunglasses for her 17th birthday on 31st May and enjoyed the different "look". Toothy bald Perlucia grinned away in the photos too, and Clara with her bandaged arm and pink Tshirt, was unusually serene and content. 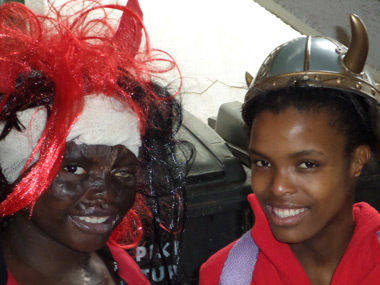 Munahse (left), Nthabiseng (right) keen actors playing respectively Lady Macbeth and Macbeth, in their own Children of Fire drama. 1st March 2014. 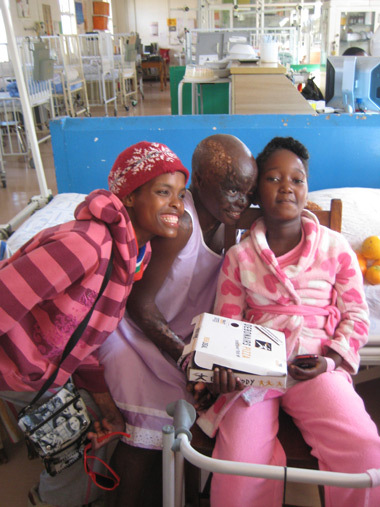 Nthabiseng (left) hugging fellow burns survivor Munashe (middle) in hospital on 11th May 2013, while visiting our children and other kids in the ward.